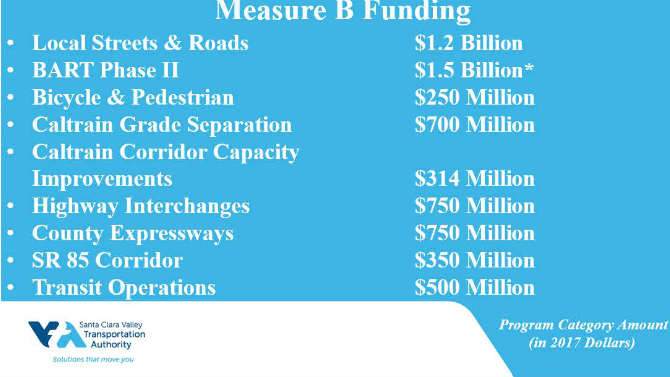 The Valley Transportation Authority (VTA) is one step closer to accessing and implementing 2016 Measure B funds. Today, the California Supreme Court denied Ms. Jensen’s petition for further review in the case of Cheriel Jensen v. Santa Clara Transportation Authority, et al., a lawsuit launched by a single Saratoga resident. This action ends the legal challenges to Measure B’s validity. This decision comes more than two years after Santa Clara County voters approved a half-cent sales tax increase for transportation improvements. VTA is now working to get this matter back to the trial court for a final order so that the funds may be released. The funds, currently kept in an escrow account until the suit is resolved, stand at roughly $340M. This process, which seeks a “final and nonappealable” decision by the court could take approximately one month. Measure B drew a whopping 72 percent of the vote when voters approved it in November 2016. Collection of the half-cent cent sales tax began in April 2017. VTA got started immediately laying the groundwork to fund the myriad of projects approved by the voters as transportation priorities for Santa Clara County. These projects range from local streets and roads repair, bicycle/pedestrian improvements, and building Caltrain grade separations to funding Phase II of the BART extension into Downtown San Jose and Santa Clara. Just in fiscal year 2018-2019, if the money were available, local cities and Santa Clara County would have been eligible for reimbursement of almost $290 million for transportation infrastructure projects. That’s in addition to a one-time advance distribution for Local Streets and Roads improvements totaling more than $9.5 million. VTA is committed to meeting the transportation needs of the residents and businesses of Santa Clara County and stands ready to begin funding voter-approved projects and programs contained in 2016 Measure B as soon as the challenge to Measure B is resolved. We’ll continue to post additional updates here.